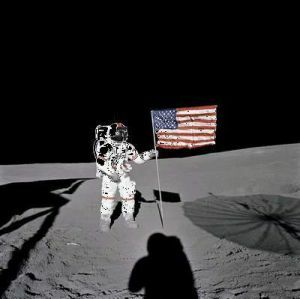 Moon Landing - Real or Hoax? For thirty seven years now the debate has raged; did the United States put men on the moon or did they perpetuate a grand hoax and film the event on earth as a propaganda campaign against the Soviet Union? From the time the first pictures of the Apollo 11 mission were publicized, people have scrutinized them and tried to point out alledged inconsistancies that "prove" it was faked. Led by authors David Percy and James Collier, the conspiracy theorists have had a field day with shadows, reflections and glare. They have picked at minutiae and used their theories as gross proof. To counter these accusations, scientists and photographic "experts" have built elaborate tests to show how these seeming discrepencies could be merely misunderstood aspects of the photographic art. For examples we will start with the first large claim by the conspirists; that despite the airless vacuum of the lunar environment there were no stars showing in the photographs. The makers of the Hasselblad cameras used have tried to explain that in order to photograph the astronauts in such a glaring environment your exposure time would of necessity be too short to pick up the minute light of background stars. They insist that the only reason the Earth showed up was because of the intensity of the light reflected from it and its proximity to the moon. Another point that the debunkers try to use is the seeming different directions that shadows point in some of the photographs. This has been attributed to the normal visual difference between a two dimensional representation and its three dimensional subject. It has been shown that in the photographs used to "prove" the hoax, one figure is standing on a slight rise therefore making the shadow fall off a bit to the right of his position as it stretches down the slope while the other figure is positioned on a flat area and gives the impression of his shadow going in another direction. Another point the theorists make is how details in the shaded areas of some of the figures "proves" there was more than the one light source of the sun. Again, it is easily shown that the cause of these so called anomolies is merely light reflecting off the rather whitish surface of the moon itself. Some of the moon landing sceptics have even gone so far as to say it was all fake because the Lunar Rover was too big to fit into the Landing Module. This theory was quickly debunked by the mere showing of the footage where it was taken out of its storage compartment. The Rover was built to fold up into a small package and had to be "unfolded" and assembled on the spot much like a puzzle cube or a "Transformer" action figure. Case by case, all of the "so called" evidence to prove the lunar landings were a hoax has been rationally shown to be misinterpretation of the data observed. The only parts that still have questions attached that I can see are some of the objects reflected in the faceplates of the space suits the astronauts are wearing. Unfortunately; because of the curvature of the face plate and the consequent distortion of these reflections, it would require much more detailed photographs than we have available to be able to positively identify these objects. Admittedly, it is a provident idea to "question authority". Governments don't always have the best interest of the governed at heart and even ours has been caught up in defarious dealings before. Before making vast claims of "Conspiracy" and "Cover Up" it is provident to put these theories to the test and make sure some simple explanation hasn't been overlooked. So it is within a 99.9% probability that the Apollo moon landings were real and took place as reported. There is still one "conspiracy theory" that seems to be constantly overlooked. NASA is the civilian space program and has done wonders with the budget allowed it. Why does no one seem to try and find out if there is a "military" space program with much better funding and possibly astounding results if we were to only know about it?